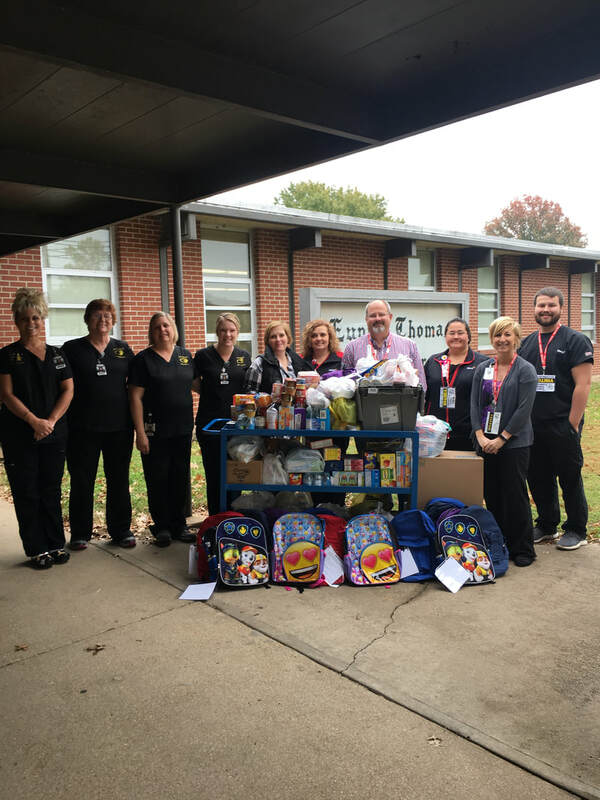 Mercy Hospital, Cassville, and the Cassville Mercy Clinic have joined forces to provide snacks, school supplies, backpacks and undergarments to the Cassville R-IV Bright Futures Program. Each department at Mercy filled backpacks full of donated items that will be given to students at Cassville R-IV. Bright Futures, established at Cassville Schools in 2011, is a not-for-profit organization dedicated to bringing community members together to focus on the success of children. Pictured, from left to right: Cassville R-IV nursing staff: Bobbi Blankenship, Elaine Boles, Cindy Thomas and Airica Fox; Kristie Preddy, counselor at Eunice Thomas Elementary School; Mercy staff: Tori Smith, John Banks, Jessica Quick, Trina Cowan and Tyler Wallace.